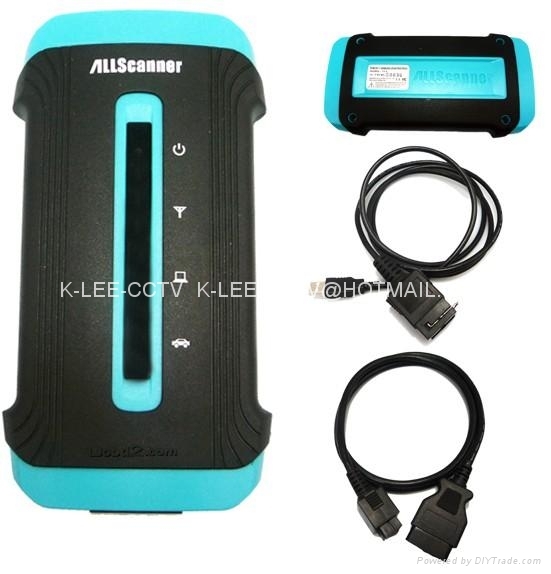 AN KLEE TECHNOLOGY CO., LTD.
ALLSCANNER is the latest auto diagnostic tool. It was designed by the new international standard, it can identify different vehicles intelligently, and it can support all vehicles in the market. It adopt wireless communication module of WIFI 802.11b/g, it can be used with Laptop or PDA. The diagnostic software can be operated under the platform of Windows and WinCE. Adopt 16 digit Dual Cell specialize CPU, Full compliant with all vehicles protocols. Use standard 802.11b/g WIFI wireless connect easy to network, or connect to Laptop to realize wireless diagnosis. Diagnostic software accord with international standard, collocate communication port flexibly, less connectors support almost all vehicles socket. Self-determination design for connectors and cables. Compliant with 12V and 24V communication, Support heavy duty vehicles. Hardware accord with CE and FCC standard. LED 4 LED indicator light indicate power and status. ALLSCANNER Diagnostic software can be operated under WinCE and Windows, available installation for Laptop or PDA. system, these will make it easily to explore the vehicles. Vedixs target will to cover all vehicles in the market. Support diagnostic software of BENZ MB STAR Be finished soon. Support diagnostic software of NISSAN Consult III On developing.